Haha - too cute! I tend to wait until I have enough mending to last me the length of a movie or so and then I do it all at once so it feels 'worth it'. I do the same with the clothing-to-iron and -to-steam piles. I love ironing fabric for quilting but hate ironing clothes unless I'm pressing newly sewn seams…. It's also why chefs have sous chefs who do all their prep work. I would be more ambitious as a cook if someone chopped all my veggies for me. lol. So, that a good idea. I know my husband say I do anything for quilting but not otherwise. I don't like taking pictures. 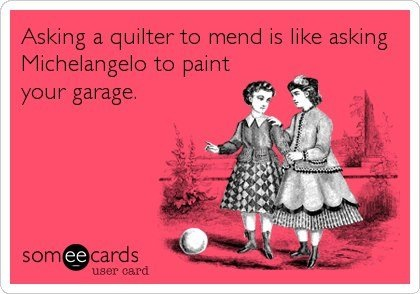 But for my quilts I will get to all technical details to take the picture or video ;). I love being a Chef too over sous ;). Same here, but these days Bill has been doing 98% of the household chores while I delve into my quilting projects, so last night I actually hand mended his socks last night!